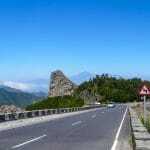 A wonderful destination for a day trip is the village Alojera. If you start the tour in Valle Gran Rey, there will be many possibilities for stops on the way. The first place to head to by rental car is the viewing point Mirador de Cesar Manrique. From there one can enjoy a wonderful view down to Valle Gran Rey, the valley of the big king, over the different districts down to the sea. If the nearby restaurant is open one should not miss to enjoy the great view from inside the restaurant whilst enjoying a cup of coffee or another drink. The next stop could be in Arure: a short walk under the aqueduct takes you to another viewing point, Mirador del Santo. From this point you have an incredibly beautiful view to the sea and over the Northwest of La Gomera. The next recommended place for a stop on this tour with the rental car is Chorros de Epina. The bar next to the little hamlet of same name offers a great view over the landscape and the sea through its panoramic windows. After this short stop the tour leads us further to Alojera, a village scattered over the beautiful valley down to the sea. The blue Atlantic and the beach is the final destination of our trip. The small bay Playa de Alojera, protected by the pier and a nearby rampart, is ideal for swimming. The small place is worth a visit because after a refreshing swim in the sea one can enjoy, in absolute silence, a marvelous sunset over the Atlantic Ocean, even with a great view to the islands of El Hierro and La Palma. 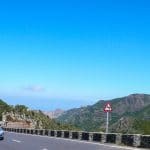 After a snack or dinner in one of the small restaurants on the beach, the rental car tour goes back through the West of La Gomera. 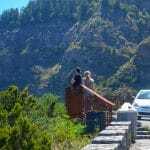 Arure, La Gomera, Mietwagen, Mirador del Cesar Manrique, Valle Gran Rey. Bookmark.